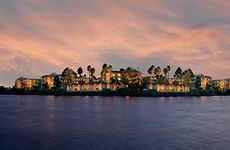 Find Loews Coronado Bay Resort deals, discounts and special offers. Loews has French-country decor in 440 rooms with bay, marina or pool views, full-service Sea Spa, beach access. Former mansion is home to Glorietta Bay Inn with a heated swimming pool, as well as access to world-famous beaches. Marriott Coronado on scenic waterfront location features full-service Spa Coronado, 3 heated outdoor pools; smoke-free. Over a century old, the famous Del Coronado has 679 remodeled rooms, 78 cottages, world-class spa and fabulous beach. Part of Coronado Del, Beach Village cottages include a 42-inch flat-panel TV, and full access to the Del Coronado spa. Spanish décor enhances boutique El Cordova hotel across from the Del; 1 & 2 bedroom suites w. ktichens. Mediterranean-style Coronado Beach has rooftop spa deck with spectacular ocean views, fitness center, & condo suites.